The budget standoff could affect thousands of federal workers in Maine and put a damper on the fall tourism season. 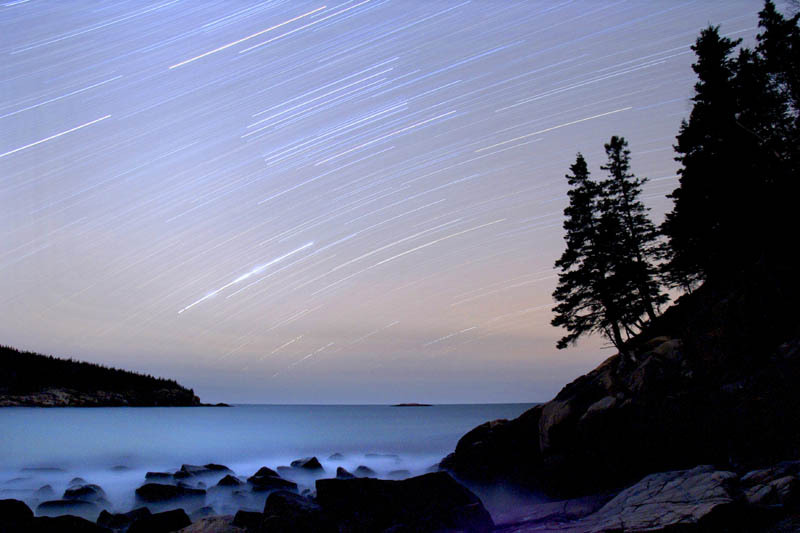 WASHINGTON – For the second time in less than six months, congressional dysfunction is threatening to put a damper on tourism around Acadia National Park as businesses face the possibility of the park’s closure at the peak of foliage season. As reluctant as he seemed to even ponder the idea, Acadia National Park Deputy Superintendent Len Bobinchock said Friday that his staff is making contingency plans in case Congress fails to pass a temporary budget bill to keep federal programs running on Oct. 1. The House and Senate were still in full bluster Friday as Republicans and Democrats dueled over the fate of the Affordable Care Act. That would include the Park Loop and the road to the summit of Cadillac Mountain — perhaps the park’s most popular spot for gazing at the multi-colored carpet of forest leading to the blue Atlantic. And hiking trails and carriage roads? “You can’t lock up trails, but you can close the roads that lead into the park,” Bobinchock said. A partial shutdown of federal government would affect Americans in too many ways to list. Passport offices, Farm Service Agencies, financial regulators and most other “non-essential” offices would be closed and workers would be sent home without pay. Social Security checks would still be paid out, air traffic controllers would still watch over the skies and the U.S. Postal Service would still deliver mail. But veterans’ disability applications would go unprocessed. And active duty military personnel would continue to work — and fight — without receiving paychecks, although retroactive pay would be likely for that group at least. Such political brinksmanship has become so routine for Congress in recent years that it was difficult to gauge Friday whether federal workers will, in fact, be sent home without pay on Tuesday, the start of the federal government’s next fiscal year. But the Senate doesn’t plan to return until 2 p.m. Monday — just 10 hours before a shutdown would begin — to respond to whatever the House does this weekend. A shutdown would have effects throughout Maine. “If the government is closed, the refuge is closed,” said Ward Feurt, manager of the Wells-based Rachel Carson National Wildlife Refuge. That means the hunters and foliage watchers who enjoy the refuge’s dozen “units” of land along the coast would encounter locked and gated roads. The more than 4,700 workers at the Portsmouth Naval Shipyard in Kittery could be affected as well. Most were exempted from the sequestration-related furloughs that started in March, but Navy officials said they are still working out the details of who would be exempt this time and who would not. The communities surrounding Acadia would likely feel the pinch more than others. “I think we are all hoping they will come to their senses and make a deal because the impact on our communities would be pretty significant,” said Chris Fogg, executive director of the Bar Harbor Chamber of Commerce. In the spring, Acadia National Park officials delayed the opening of the Park Loop Road by about a month because of the across-the-board spending cuts produced by another congressional stalemate on the federal budget. Fogg said 70 percent of the businesses that responded to a survey by the chamber said they were hurt by the delayed opening, reporting average losses of 10 to 20 percent during the month compared with previous years. 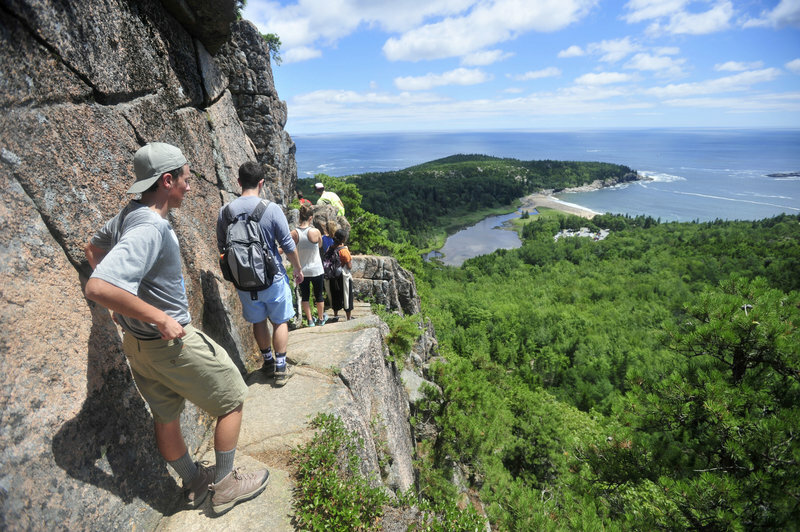 About 600,000 people visit Acadia in September and October, said Bobinchock, the deputy superintendent. Thousands of visitors make their way to the Jordan Pond House, a restaurant and gift shop that’s within the park and accessible only by park roads. The Jordan Pond House is run by a private concessionaire, Acadia Corp., not the federal government. Michael Daley, the operations manager, had just received the email Friday afternoon informing him that the park will close in the event of a shutdown. That would close down the Jordan Pond House, which has about 50 employees serving about 1,000 customers a day. “It would certainly be a negative impact, especially during a year when we got a slow start” because of the Park Loop Road’s late opening, Daley said. 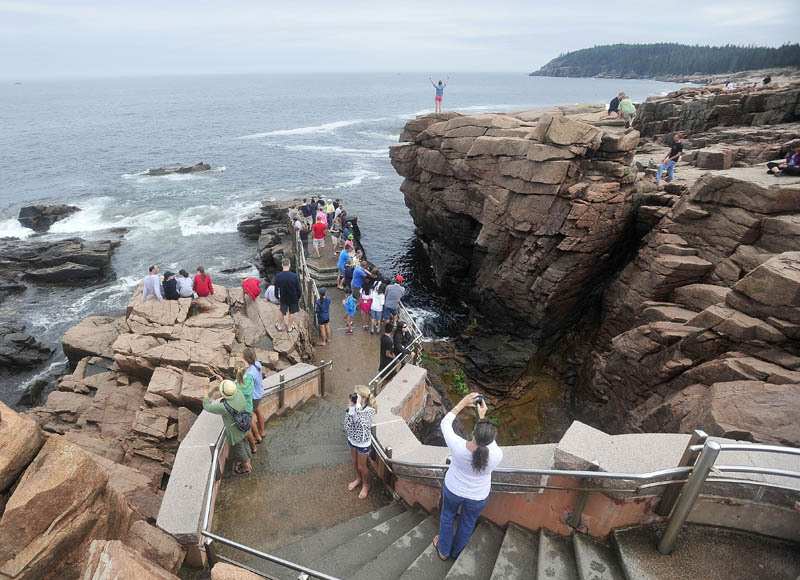 More than 40 cruise ships carrying tens of thousands of tourists are scheduled to stop in Bar Harbor during October. Of course, Acadia National Park is only one tourist destination on Mount Desert Island and along that stretch of coastal Maine. Fogg and Tibbetts said that even if Acadia is closed, people can enjoy the fall scenery from the waterfront, along the public roads or on accessible park trails and carriage roads. “We always hope people will come to Bar Harbor, regardless,” said Tibbetts, at the Bar Harbor Quality Inn, putting on her best cheerful hotelier voice.